It’s not exactly a hoax. It started out as just bad reporting of history. In his search for an easier route from Spain to China, in which he stumbled into the Americas, Christopher Columbus knew with certainty the Earth is a round ball. The story that he proved the Earth round, or rather than he laid the foundations for Magellan to prove the Earth round, is only a story, mostly devoid of fact. Sailors knew something was up just from their having watched things while sailing on the ocean. One can deduce the ball shape of the planet by watching other ships as they sail away, and sink below the horizon. Were sailors of a more scientific bent, they could have made much of the fact that the guy in the crow’s nest could see a ship moving away — or an island or a continent — for a time longer than those a few dozen feet below, on the deck of the ship. Long before that a Greek librarian and polymath, Eratosthenes, figured out that the surface of the Earth is curved, deduced that the planet is basically a ball, and calculated very closely how big the ball is, merely by noting the different shadows cast by the sun at the Spring/Vernal Equinox. Carl Sagan used this story way back in his famous PBS series, Cosmos. It’s still interesting, informative and instructive today (surely Texas 9th grade geography teachers use this example all the time, no? 9th grade math teachers? Say, what?). You can find this and more Sagan videos at the Carl Sagan Portal on YouTube. Bathtub Art Figure 1: Eratosthenes’ measurement of the Earth’s circumference. Eratosthenes calculated the circumference of the Earth without leaving Egypt. Eratosthenes knew that, on the summer solstice, at local noon in the Ancient Egyptian city of Swenet (known in Greek as Syene, and in the modern day as Aswan) on the Tropic of Cancer, the sun would appear at the zenith, directly overhead (he had been told that the shadow of someone looking down a deep well would block the reflection of the Sun at noon). 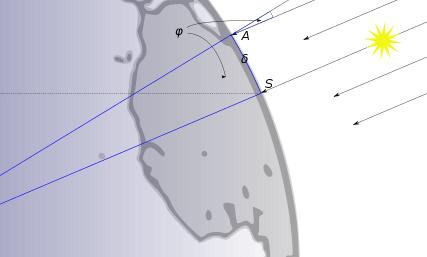 Using a gnomon, he measured the sun’s angle of elevation at noon on the solstice in his hometown of Alexandria, and found it to be 1/50th of a circle (7°12′) south of the zenith. Assuming that the Earth was spherical (360°), and that Alexandria was due north of Syene, he concluded that the meridian arc distance from Alexandria to Syene must therefore be 1/50 = 7°12’/360°, and was therefore 1/50 of the total circumference of the Earth. His knowledge of the size of Egypt after many generations of surveying trips for the Pharaonic bookkeepers gave a distance between the cities of 5,000 stadia (about 500 geographical miles or 927.7 km). This distance was corroborated by inquiring about the time that it takes to travel from Syene to Alexandria by camel. He rounded the result to a final value of 700 stadia per degree, which implies a circumference of 252,000 stadia. The exact size of the stadion he used is frequently argued. The common Attic stadion was about 185 m, which would imply a circumference of 46,620 km, which is off the actual circumference by 16.3%; too large an error to be considered as ‘accurate’. However, if we assume that Eratosthenes used the “Egyptian stadion” of about 157.5 m, his measurement turns out to be 39,690 km, an error of less than 2%. Syene ( ) is located on the Tropic of Cancer, so that at summer solstice the sun appears at the zenith, directly overhead. In Alexandria ( ) the sun is south of the zenith at the same time. So the circumference of earth can be calculated being times the distance between and . Erastothenes measured the angle to be 1/50 of a circle and his access to knowledge of the size of Egypt gave a north/south distance between Alexandria and Syene of 5000 stadia. His circumference of the Earth was therefore 250 000 stadia. Certain accepted values of the length of the stadia in use at the time give an error of less than 6% for the true value for the polar circumference. A fun little exercise, but a remarkable achievement for anyone about 240 years before the birth of of the Biblical Jesus. 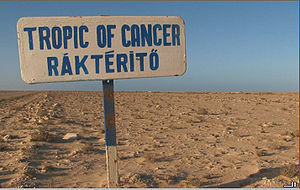 Syene, now known as Aswan, is on what we now call the Tropic of Cancer (the “tropics” were named by the Greeks, but I am uncertain whether the line had that name in Eratosthenes’s time). The date is probably not important, so much as the observation that the sun was vertical at noon on a given date — and then Eratosthenes’s experiment to see whether that were true in Alexandria, and then his understanding of what that might mean and his work to assemble the data to make the calculations. High school students — heck, junior high school students — should be able to figure all that out today, if they had the basics down. I suspect that knowing this story would be a spur to students to learn the elements of the mystery and how it was solved, and what it might mean for later navigators of the oceans, land and air, for astronomers, for farmers and for mathematics. I’m just like Eratosthenes peeking into a well here, and I don’t know what it means yet. It’s an entertaining read and more enlightening that one might think from his forays here, so you probably ought to go read the FAQ and the reasons Morgan misbelieves liberals miss out on Eratosthenes’s wisdom. Morgan has an explanation of Eratosthenes and his discoveries which I find too brief to be accurate (and I’m not sure why Morgan finds the name “Beta” to be dubious; being a polymath was not a small thing then, or now; second best in everything means one is first in the All-Around, first in the academic centathlon or millathlon — no mean set of feats at all). I find that funny because, while he makes a pretense and some effort to following Eratosthenes and scientific methods, to me he seems to find science and logic things to run away from, as in our recent discussion where he ends up defending Anthony Watts’s erroneous views because Watts’s critics didn’t link to Watts (see comments in “It’s raining crazy,” and see also Morgan’s own post, which defies explanation). Eratosthenes would find that funny, too, I hope, but not a demonstration of Eratosthenian logic and calculation. Does anyone doubt where Carl Sagan would be in the debate between the dozen serious scientists and hundreds of political wankers who deny climate change, and the thousands of scientists and good citizens who recognize that it occurs and think we should get on with saving the future? Fly your U.S. flag today. Fly it to honor Columbus’s discovery of the Americas. The second Monday in October is celebrated as Columbus Day, a federal holiday (though not widely honored in private enterprise). Columbus made landfall in the Americas for the first time on October 12, 1492, 516 years ago. You are currently browsing the archives for the Christopher Columbus category.